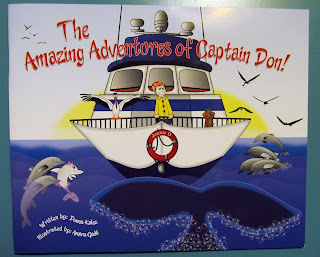 Life with Dylan: The Amazing Adventures of Captain Don! I don't know about you, but I love reading stories to my son. 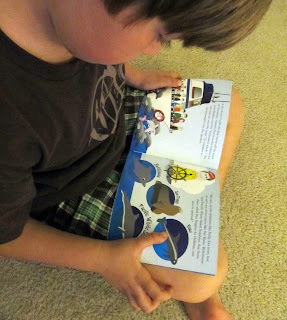 Even though he can read to himself, it's still fun to read aloud and get lost in the story with him. Last week I saw a post on twitter about a great book for kids on whale watching from Dana Wharf. The first 10 people to reply would get a free copy of the book. I never reply - because I never win - but this time I did, and I got a copy of the book. Knowing nothing about the book, I didn't know what to expect. Would it be age appropriate for my son? Was it just a book advertising whale watching trips at Dana Wharf? To my surprise, this turned out to be the cutest book I've seen for kids on what to expect on a whale watching trip. For this reason, I had to share it with you. The Amazing Adventures of Captain Don! is written and illustrated for kids of all ages. Everyone from a toddler to a 10 year-old will love this book. I love this book. Join Captain Don on a day in his life as the captain of a whale watching boat. Learn about what you will see and how every trip is different. Some days you will see a mega pod of dolphins and other days you might see a mysterious whale. Could it be a new kind of whale? Maybe even a whale unknown to a Marine Biologist. Not only is this a fun story to read, but the book has educational value too. I love that there is a glossary in the back with easy to understand definitions of words like fluking and bow riding, along with pictures to aid in the understanding. After receiving my free book, I contacted Dana Wharf to ask where this book could be purchased. I found out that you can purchase it online or at the Dana Wharf store for only $7.95. I was also happy to learn that this is the first in a series of books, chronicling the authors experiences on the waters off Orange County with her father, Don Hansen. The main character, Captain Don, is based on her father. The Amazing Adventures of Captain Don! is written by Donna Kalez and illustrated by Amira Gadd.